1. Fix hook in the vice and run thread down the shank to the bend. Catch in three or four strands of dyed Amherst pheasant tippets. 2. 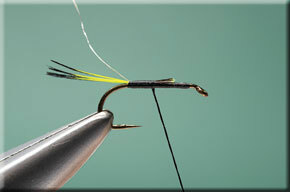 Secure the tippet strands with tight thread turns then catch in a length of fine silver tinsel at the base of the tail. 3. Use close turns of thread to secure the waste ends of both the tippets and the wire along the shank. This layer of thread forms the body. 4. Once a slim, slightly tapered body has been formed with the tying thread, apply evenly spaced turns of the silver wire to create the rib. 5. Secure the loose end of wire and remove the excess. 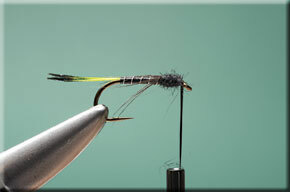 Next, select a black hen hackle and remove the tip to leave a V-shaped section. 6. 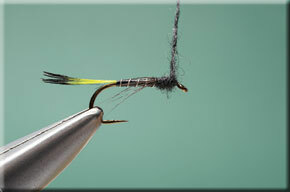 Remove base fibres of hackle to leave just four fibres either side of stalk. 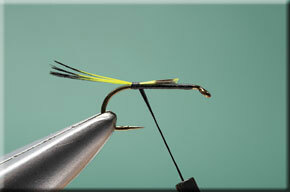 Catch the hackle in on top of the shank just in front of the body. 7. Apply a tiny amount of fine, black fur to the thread. Dub it on, then wind the fur rope in close turns to form a slim thorax. 8. Once the dubbed fur has reached the eye apply a couple of extra thread turns then cast off with a whip finish.